At the Prince County Hospital, Summerside, on Monday, October 15, 2018, with her loving family by her side, of Joyce Elizabeth Hardy, of 390 Brophy Avenue, Summerside, formerly of Elmsdale, aged 85 years. Beloved wife of the late Arnold Hardy, predeceased her in July 1974. 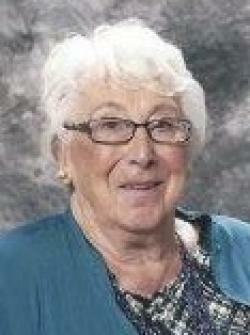 Born at Elmsdale on April 25, 1933, she was daughter of the late James Everett and Agnes Edith (nee Stewart) Williams. Loving mother to Darrell (Janice), Bakersfield, California, David (Helen) New Dominion, PE, Dawn Hardy (Ron Palmer), Miscouche, and Dale (Tracie) of Chatham, ON. Cherished grandmother of Daniel, Ashley, Ryan, Shannon, Tyler, Tara, Tessa, Tasha, Robyn, Jay, Logan, and Brett. Great-grandmother to Sampson, Joseph, Sydney (deceased), Emma, Anna, Ella, Ava, Tia, Shay, Hunter and Blayke. Also survived by a sister-in-law, Marion (late Hillard Pridham) Alberton. She will be sadly missed by her cousins and friends. Predeceased by a brother-in-law, Roy (late Pat) Hardy. Resting at the Rooney Funeral Home, Alberton. Visiting hours Wednesday 5:00 to 8:00 pm. Funeral Thursday morning from the E. Gerald Rooney Memorial Chapel at 10:30 am., Rev. Lynn Mackinnon and Rev. John A.C. Wilson officiating. Interment in the Elmsdale Church of the Nazarene Cemetery. Memorial donations to the Elmsdale United Church Building Fund would be gratefully appreciated.